Individuals and businesses who buy a brand new hybrid, electric, or diesel fuel vehicle can take advantage of the "Alternative Motor Vehicle Credit." This tax credit applies to new cars and trucks that are certified for the credit by the IRS. Qualifying vehicles purchased on or after January 1, 2006, are eligible for a tax credit ranging from $400 to $4,000 based on fuel economy. The alternative motor vehicle tax credit is actually a combination of two separate tax credits. The math is complicated, and fortunately, you won't have to calculate it. The car manufacturers and the IRS will certify the tax credit amount of qualifying vehicles. The alternative motor vehicle tax credit may be short-lived, depending on consumer demand for the new cars powered by fuel-efficient hybrid, electric, and clean diesel motors. Most of the cars certified for the credit are hybrid cars. 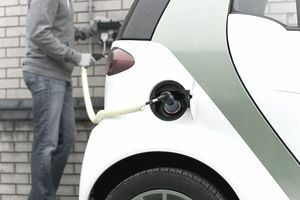 But the credit is also available for electric vehicles and diesel cars using advanced lean-burn technology. The dollar value of the tax credit will start to be reduced once a manufacturer sells 60,000 qualifying vehicles. The phaseout occurs at the manufacturer level. So popular brands may see their tax credits reduced sooner than less popular brands. Here are the time periods and dollar amounts for the alternative motor vehicle tax credit. How Will You Know What the Tax Credit Amount Is? The IRS has certified various makes and models for the hybrid credit. These certifications indicate the maximum dollar value that your tax credit will be. Your alternative motor vehicle tax credit may be reduced by various limitations. Perjury statement as follows: "Under penalties of perjury, I declare that I have examined this certification, including accompanying documents, and to the best of my knowledge and belief, the facts presented in support of this certification are true, correct, and complete." You should keep this tax certification for at least four years. How to Qualify for the Alternative Motor Vehicle Tax Credit? Purchase the vehicle new, not used. The vehicle must be used for your own personal or business use. The vehicle should not be bought with the intention of re-selling it. Actually, there are seven criteria for being eligible for the hybrid tax credit, but these are the three criteria that you can actually control. The other criteria relate to the fuel economy and energy efficiency of the vehicle. These other criteria are reviewed by the IRS when they certify a particular vehicle for the alternative motor vehicle tax credit. You must purchase a qualifying vehicle, and the qualifying vehicle must be "placed in service" in during the tax year for which you claim the tax credit. Placed in service means when you actually take possession of the vehicle, according to Mark Luscombe, JD, CPA and principal federal tax analyst for CCH. You must take delivery of the vehicle on or after January 1, 2006. The alternative motor vehicle tax credit is a non-refundable tax credit. The credit will reduce your regular income tax liability, but not below zero. The credit will not reduce your alternative minimum tax if that applies to you. Change for 2008 only: the AMT patch provided as part of the Emergency Economic Stabilization Act allows otherwise nonrefundable personal credits to offset the AMT for 2008.
minus the tentative minimum tax calculated under the AMT rules. For 2008, the AMT patch mentioned above allows you to use the alternative motor vehicle credit to offset any AMT liabilities. The credit would thus be limited to your regular income tax, plus the AMT, minus other tax credits. Any tax liability left over by these reductions will be the maximum dollar limit of your alternative motor vehicle tax credit. If your hybrid tax credit exceeds your maximum dollar limit, the excess is not refundable and is lost forever. The excess cannot be carried over to another year or given away to another person. If you cannot use all your hybrid tax credit, w have some good news for you. It might be possible to have a family member purchase the car for you. The key is following the law and making sure that the person who buys the car has enough tax liability to take full advantage of the hybrid tax credit. The law forbids taxpayers from buying a new hybrid vehicle with the intention of reselling the car. The taxpayer must purchase the hybrid car or truck with the firm intention of using the vehicle personally. Therefore, we would caution against re-selling the car or giving the car as a gift. Here's what we suggest you do instead. The taxpayer with the highest regular tax liability should purchase a qualifying alternative fuel car or truck. The taxpayer would be the owner of the car, would register the car in his or her own name, and would be responsible for insurance, maintenance, and other car ownership responsibilities. But the taxpayer would allow you to use the car, as needed, for free. For example, Sarah wants to buy a new hybrid car, but she can use only $1,500 of the estimated $3,000 alternative motor vehicle tax credit. Her brother Steven has a substantial tax liability and can take advantage of the full amount of the alternative motor vehicle tax credit. Steven should purchase the hybrid car for his own personal use, but allow Sarah to borrow the car as she needs it. Under no circumstances should Steven sell or give the car to Sarah. The tax law might allow a taxpayer to lease a qualifying vehicle. The lease would have to be for a period of time not less than the "entire economic life of the vehicle." For example, Steven (from the example above) might write up a lease contract in which he leases to Sarah the hybrid car "for the entire economic life of the vehicle." Under such a long-term lease agreement, Steven would retain full ownership of the hybrid car, and Sarah would only be leasing it. However (and this is a big however), We would caution you to wait until the IRS releases regulations to interpret this new tax law before entering into such an arrangement, just to make sure you are fully eligible to take advantage of the alternative motor vehicle tax credit. The new law for the alternative motor vehicle tax credit requires taxpayers to recapture their hybrid tax credit if they re-sell their hybrid car or truck. Further details will be provided by the IRS when they issue regulations to interpret and implement this new tax law. For now, we would advise against selling, leasing, or giving hybrid cars away until we find out how long you have to keep the car. The hybrid tax credit is available to both individuals and businesses, including self-employed people. Business owners are accustomed to depreciating their business assets, and sometimes taking a Section 179 deduction to expense some or all of their assets in the first year of use. The cost basis of a hybrid car must be reduced by the allowable amount of the hybrid tax credit. After cost basis is reduced, the remaining basis can be depreciated or expensed as a Section 179 deduction. You will notice that several 2005 models are certified for the hybrid tax credit. If you bought a 2005 hybrid on or before December 31, 2005, you qualify for the clean fuel deduction, but not for the new hybrid credit. However, if you bought a 2005 hybrid on or after January 1, 2006, you will qualify for the new hybrid credit but not for the old clean fuel deduction. The alternative motor vehicle tax credit will begin to phase out once a manufacturer sells more than 60,000 qualifying vehicles. Based on sales data, the IRS has set phaseout periods for the following vehicles. 100% credit: for eligible vehicles purchased before April 1, 2009. 50% credit: for eligible vehicles purchased between April 1, 2009, and September 30, 2009. 25% credit: for eligible vehicles purchased between October 1, 2009, and March 31, 2010. 0% credit: for vehicles purchased April 1, 2010, or later. 100% credit: for eligible vehicles purchased before January 1, 2008. 50% credit: for eligible vehicles purchased between January 1, 2008, and June 30, 2008. 25% credit: for eligible vehicles purchased between July 1, 2008, and December 31, 2008. 0% credit: for vehicles purchased January 1, 2009, or later. 100% credit: for eligible vehicles purchased before October 1, 2006. 50% credit: for eligible vehicles purchased between October 1, 2006, and March 31, 2007. 25% credit: for eligible vehicles purchased between April 1, 2007, and September 30, 2007. 0% credit: for vehicles purchased October 1, 2007, or later.